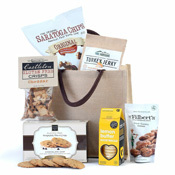 Gluten-free gifts that taste good are hard to come by, but we've hit the nail on the head with this gluten-free Italian gift tote! Italian food lovers will appreciate the highly acclaimed gluten-free pastas from Rustichella d'Abruzzo. Tops in a taste test conducted by Food & Wine Magazine, Rustichella's corn fusilli is nice and firm with good corn flavor....perfect for pairing with hearty sauces, like the award-winning Puttanesca and Due Formaggi sauces from Casina Rossa, both included here. Those who prefer a rice-based pasta will appreciate gluten-free Rice Penne Rigate. Made with organic Italian rice flour, the pasta has a superb texture and flavor, and the sauces cling to it beautifully. Gluten-free chocolate & hazelnut cookies from Primo Pan provide a sweet bite after dinner. Made with Piedmont hazelnuts, egg white, sugar, cocoa and vanilla, the flourless cookies are crunch and light...perfect for enjoying with an espresso or a cold glass of milk! Smartly packaged in a handsome jute tote bag, this is an ideal gift for anyone who appreciates fine Italian foods but is eating gluten-free. Rustichella d'Abruzzo - Gluten-Free Corn Fusilli: Made with organic, non-GMO Italian corn, the pasta has superb texture and good corn flavor, ideal for pairing with hearty red sauces. Rustichella d'Abruzzo - Gluten-Free Rice Penne Rigate: Made from Italian rice flour, penne rigate is one of Italy's most popular pasta cuts. Serve with vegetables and drizzle with extra virgin olive oil. Casina Rossa - Sugo al Pomodoro Puttanesca Sauce: Lush, ripe Italian tomatoes are blended with extra virgin olive oil and the classic Puttanesca ingredients including olives, capers, pine nuts & raisins in this full-bodied, award-winning pasta sauce. Casina Rossa - Due Formaggi Pasta Sauce: A silky rich sauce made with two classic Italian cheeses: pecorino and aged ricotta. Primo Pan - Gluten-Free Chocolate Hazelnut Cookies: Light as a cloud and full of flavor, these gluten-free cookies are made from 40% Piedmont Hazelnuts, egg white, sugar, cocoa and vanilla. A delicious ending to a gluten-free Italian meal!